COLORADO SPRINGS, Colo. — USA Triathlon today announced Thorne Research will become its exclusive nutritional supplements partner, bringing the highest level of dietary science to advance the well-being of the organization’s professional and amateur athletes. The partnership, which runs through April 2019, will provide support to the USA Triathlon and USA Paratriathlon National Team Programs, including nutritional supplement products with the highest level of certification by NSF International, baseline prevention and wellness markers consisting of blood, microbiome and genetic testing through WellnessFX and educational materials. USA Triathlon’s athletes will have access to expert health data from Mayo Clinic to support the evaluation of supplement usage and understanding of supplement ingredient labels, manufacturing and regulation. 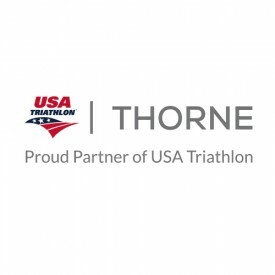 Thorne Research will also provide USA Triathlon annual members with a discount on all products found at usa-triathlon.thorne.com. Members will access the discount code by logging in to their membership account on usatriathlon.org. As part of the new relationship, a health resources section is located at usatriathlon.org, featuring a collection of informative articles to serve USA Triathlon’s entire athlete community. For more on Thorne Research, visit thorne.com. Thorne Research is a personalized health solutions company dedicated to improving individual outcomes through science and technology. For 30 years, Thorne Research has led the nutritional supplement industry in providing researched-based, high-quality natural products, including foundational vitamins and minerals, therapeutic-focused nutritional supplements, and soon to include botanical drugs. By leveraging cutting-edge research and personalized data through affiliate WellnessFX, Thorne Research offers customized preventive health solutions for practitioners, their patients and athletes. Thorne Research is a majority shareholder in WellnessFX, a San Francisco-based personalized wellness company providing home kit testing and actionable recommendations from the analysis of blood chemistry, genetics and microbiome. Thorne Research is headquartered in New York City, with a manufacturing facility in Sandpoint, Idaho. Further information on Thorne Research is available at thorne.com.